It is said marriages are made in heaven and after going through the chapters of my life, I have to agree that it is true. 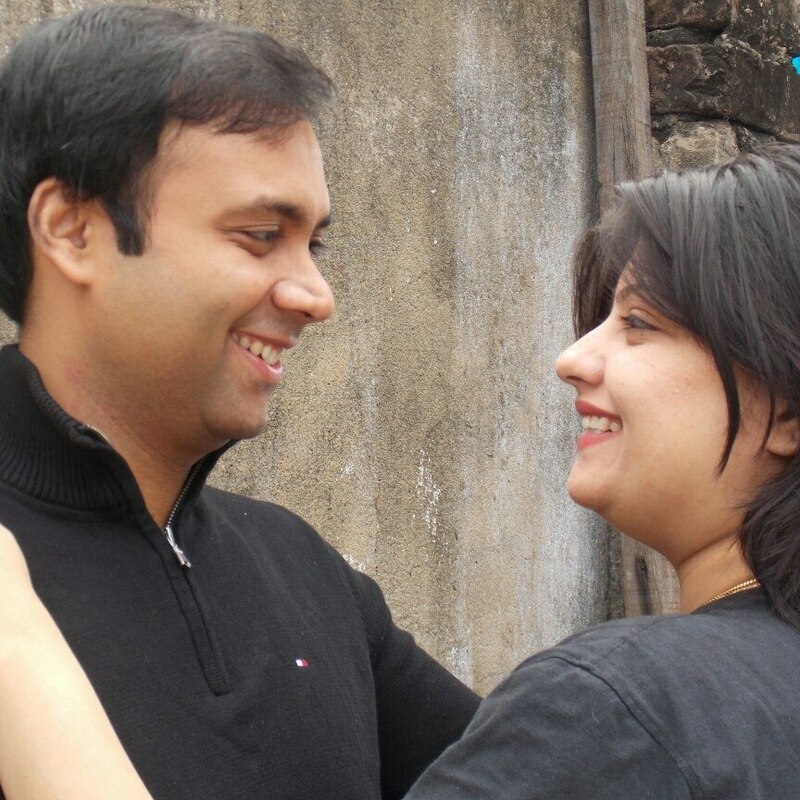 Two years back at this time, I met the person who is now my husband. I was not exactly looking for marriage at that time because I was too busy with being happily single and independent. I was looking forward towards career growth and travelling the world and decided that marriage can wait. However, deep down my heart, I must be hoping to meet my soul mate someday and this is why I had probably opened my profile on shaadi.com, because travelling the world with someone you love is not a bad idea after all. So let me start with how we met. He saw my profile on shaadi.com and then on Facebook and sent a message stating that he was interested in my profile and was willing to talk. I obviously went through his profile and found he was a doctor and we had a mutual friend. So before replying to his message, I first texted that mutual friend and enquired about him. When I got an answer in the affirmative, we started chatting. Those were good days, knowing each other, our likes and dislikes. He was studious like me, educated, settled, and a travel enthusiast. I realised that he was a lot like me. Our first date was in Benjarong and I liked him a little more when I realised that he was also a foodie like me. I had about 10 months time to make the wedding preparations. Like every other girl, I had a lot of dreams for marriage. I wanted to look as beautiful as a goddess and make that event the most memorable event of my life. But dreams also come with a lot of responsibility towards making them a success and in my case it was all the more stressful as i was the wedding planner of my own marriage. Although, my parents and friends were there to support, but I had to take everything on myself, from booking the venue to appointing the makeup artist, photographer, caterer etc. I booked the venue immediately after the date and guest list was finalised i.e. in January 2015. While booking the same, I had to concentrate on a large area where there would be no congestion for the guest list totalled to 500 and the accessibility of the area. After scouting for some locations, we decided on a spacious three storied building at Sreerampur Club, Garia. They had their own decorator and electrician with whom I had meetings on the look of the venue. I love flowers and ensured there were plenty of them. I chose a theme of white and red flowers. I ensured with the electrician that bright lights covered every part of the venue and decided on using some decorative trees too. Tell us something about where you got your outfits, both wedding and reception? It was then time for the most exciting part of the wedding preparations, shopping for the bridal trousseau. I always wanted to wear a red benarasi sari and I had no second opinion on it. We got the sari from a local boutique. 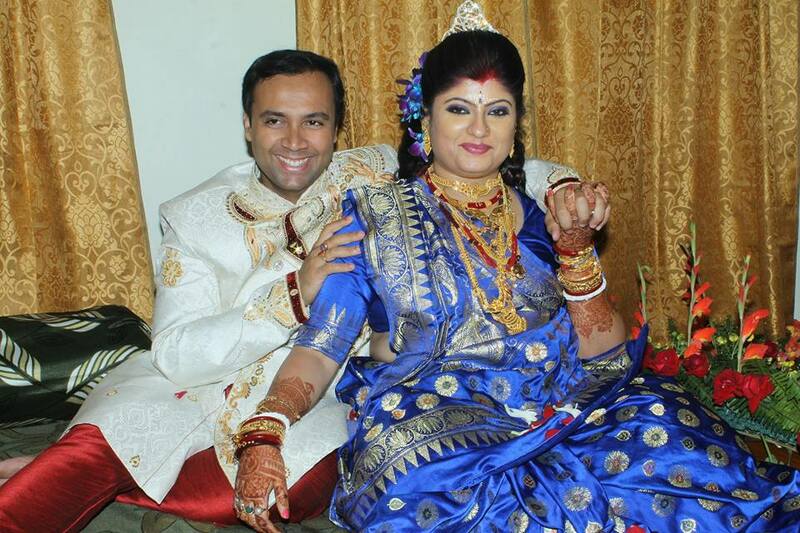 For the reception, we bought a dark blue meenakari benarasi sari from Priya Gopla Bishoyi. I am an ardent admirer of saris and what better occasion to shop than my own wedding. Apart from benarasis, we bought a bright yellow and red jamdani for gaye holud, purple south silk for aiburobhat, green tant for the morning, another pink benarasi for the bou bhat ritual. 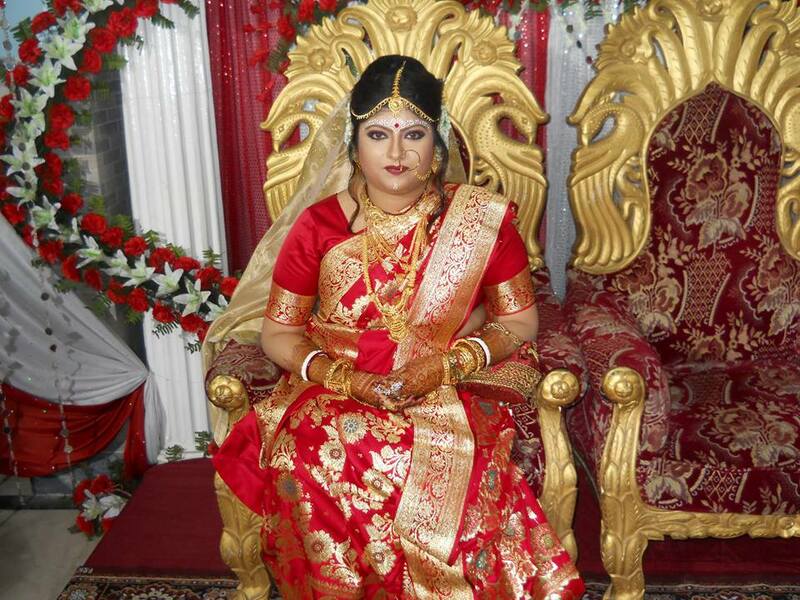 My friend, Bhramari Biswas, had designed a very pretty red chiffon sari with golden border for the fulsojja. Besides we shopped for saris, mainly tant and silks for my mother, mother-in-law and other relatives for the totto. The best part of the shopping was it was like a family get together, me, my husband, my parents and parents in law. Tell us something about where you got your accessories, both wedding and reception? 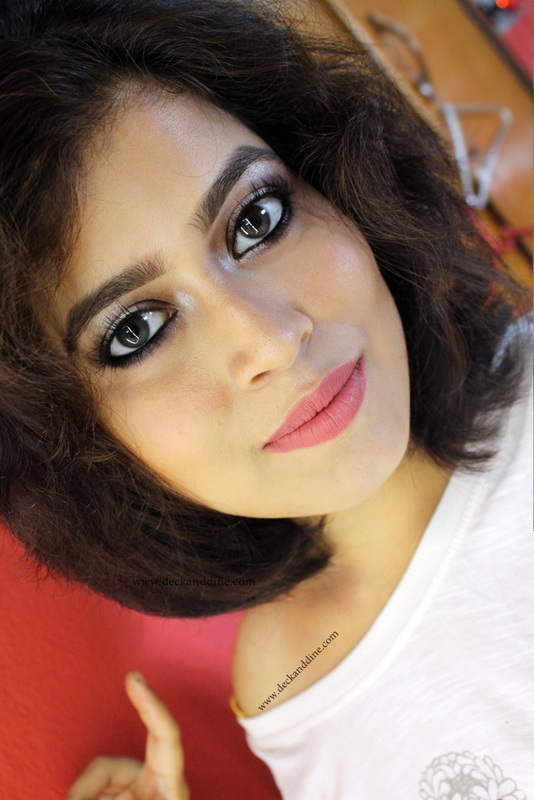 I started reading a lot of wedding magazines and searched on pinterest and googled blogs by real brides to get ideas on my bridal look, accessories, menu and honeymoon destinations. I bought my gold jewelleries, which was a "sitahaar" from Senco Gold, Jadavpur with matching earrings. My mother gifted me her wedding necklace and another necklace was gifted during the ashirbad ceremony by my in-laws. They had also given me one mantasha and one bala for my hand. I bought another mantasha and another bala, again from Senco Gold. 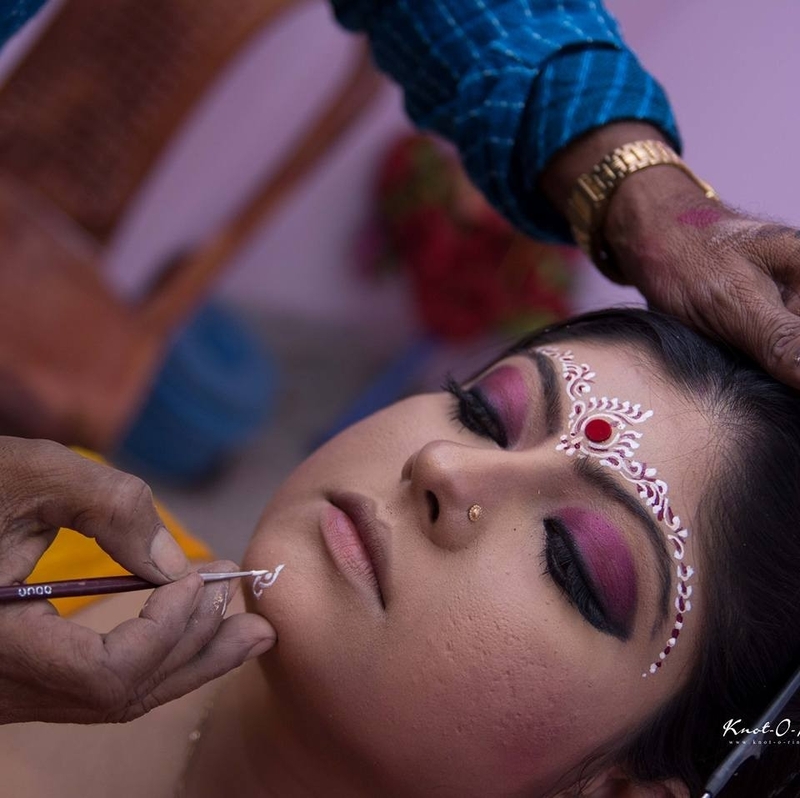 My grandma had given me a set of chur but the most precious of all those bangles were the sankha and pola which I wore at Kalighat Mandir on the morning of my marriage. I wanted to create two different looks for my wedding and reception; therefore I chose tiara and tikli for wedding and a crown or mukut for reception. However, I am extremely fond of nath and had two different sets for both the days. My husband gifted me a diamond wedding ring and a diamond nosepin from PC Chandra Jewellers, Bhawanipore and I gifted him a Nokia DSLR camera from e-mall. I shopped for my wedding accessories from Metro, which were golden and silver shoes embellished with stones, a red and golden potli and a stone studded clutch. 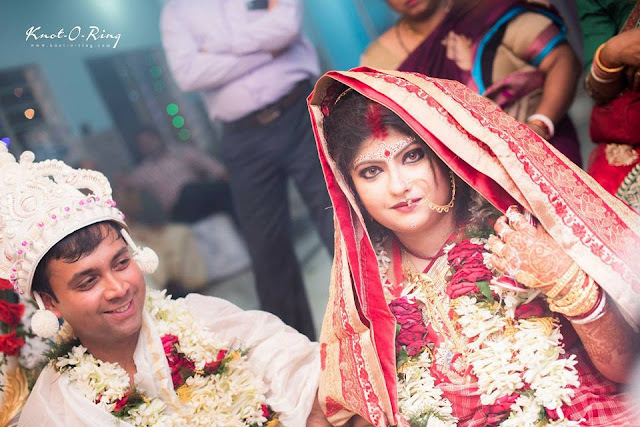 My photographers were Urmi Rudra and Siddhartha Das, both my friends since school and now professional photographers. My makeup artist was Bacchu Chakraborty, a well known bridal artist in Kolkata. During those ten months of wedding preparation, one of the most memorable moments was planning and booking for our honeymoon. 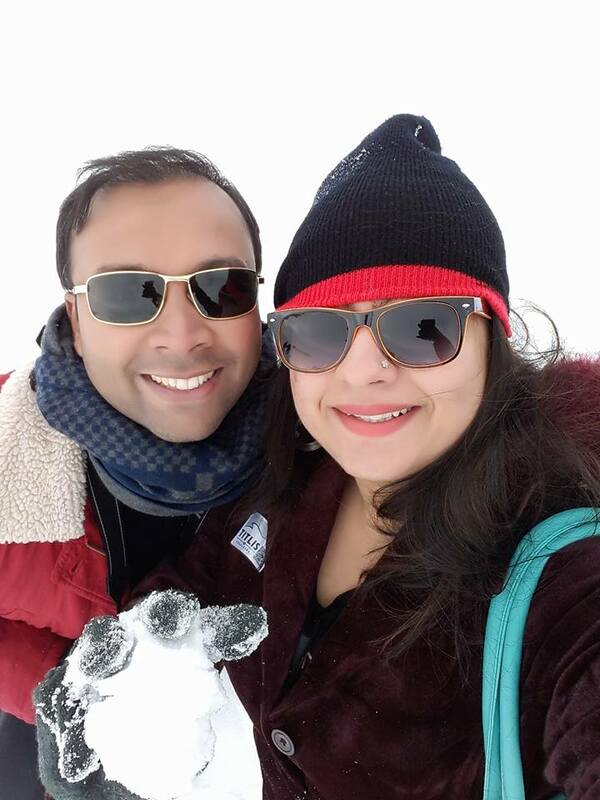 We had decided to visit Switzerland initially for 7 days but then my husband went on adding London, Paris, Amsterdam, Belgium, Austria and Italy too with the itinerary. We booked our travel with SOTC, Kuoni for May 2016 as Europe is best visited during summer. However, I also wanted to visit some place immediately after wedding and hence we zeroed in for Andamans for December. The last month was reserved for sending invites to guests and making last moment confirmation with all the vendors. For the menu, we chose an elaborate Bengali spread including Mutton bhetki paturi and fish fry. On the Reception day, we had prawns, kebabs and fish kabiraji among several other things. Months of preparations finally culminated into four days of celebrations when two souls got entwined in one and locked themselves in the prison of love forever. 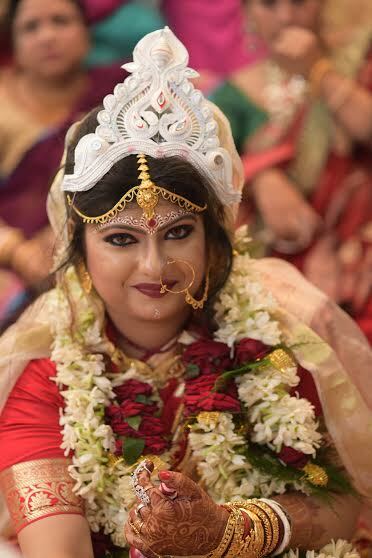 I am lucky that the entire ceremony went on smoothly and everyone complimented me and said that I looked like Goddess Durga and as far as my better half is concerned, his smiles said it all! For all the would be brides, there is this one advice: this is a once in a lifetime opportunity. So make the most of it. Do not stress out but do everything possible to make this dream come true. 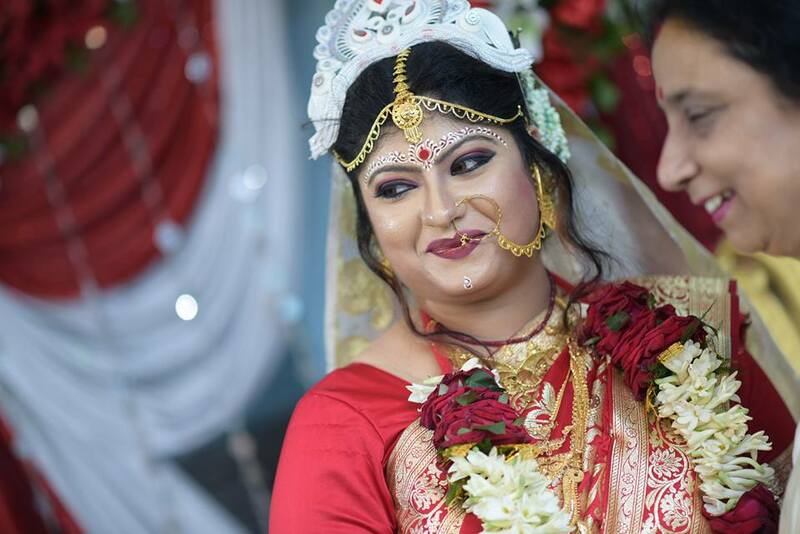 It is really great to see someone, who has been your inspiration in school, getting married. You wanted to look like a goddess and you really looked like one. Getting married is the most beautiful thing that could ever happen to a girl.Great post.I almost relived my entire marriage arrangements and planning while going through this post . Great post dear. Wow,she is so beautiful :) This post reminded me of my marriage :) Loved reading every bit of it. She is beautiful and adorable.. love this series..
Oh wow ! LOVE IT ! may God Bless the couple !! the couple is looking awesome.